As all three of us originate from the western part of the US, specifically California, we hope that the music represents our feelings about this area of the world, Larry Grenadier says. It is a landscape filled with open spaces, amazing colors, and every possible variety of panorama: desert, mountains, the ocean. We can't help but be influenced by all of this in our music. We hope that the listener gets a sense of this as well. The title also refers to the idea of the wild west where the rules haven't been written yet, anything is possible, and people go there to reinvent themselves. As Grenadier has explained, Fly was formed out of a desire to share all the knowledge that we ve accumulated separately and bring it together in this bare-bones format . Fly s unique approach to the pianoless trio, with its selfless, collaborative spirit (to quote Time Out NY), and its eclectic yet tightly focussed music, has since become a reference for players and listeners alike. Mark Turner s saxophone lines are at once carefully constructed, inventive and exploratory, and span the full reach of the horn. His control of the tenor sax s altissimo register is especially remarkable. 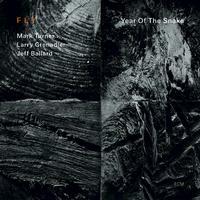 So is the way in which his playing on Year of the Snake contrasts with the extroverted approach exhibited on the recently released All Our Reasons by the Billy Hart Quartet: Turner is clearly giving much thought to context. The work is not about transferring a single soloistic method from one band to another; Fly has its own ensemble identity, well-served by each of the players. The saxophone s simmering intensity beneath a seemingly cool surface is mirrored by Jeff Ballard s drumming, as constantly changing rhythm patterns draw from a variety of drum traditions in jazz and beyond, emphasizing and stretching and dissolving the time. Larry Grenadier often engages with Turner into a lively play of roles, answering the tenor s lines with counter melodies, or, increasingly, using the bow to play unisons with the sax. Grenadier s arco playing gives Fly an added dimension , Jeff Ballard says. I think the group sounds bigger now.